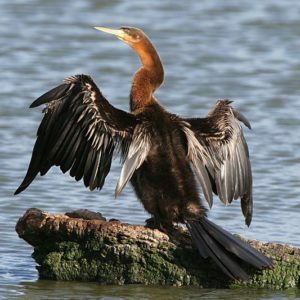 Large dark water bird. Distinguished from cormorants by pointed bill and much smaller head, long thin neck. Swims low in water, usually with only long neck and head showing, resembling a snake. mainly fish but also frogs and aquatic arthropods. 80 cm Resident mainly fish but also frogs and aquatic arthropods.